Historically, Norwich has been a city of utmost importance within the United Kingdom, coming only second to London in terms of population and influence between the 11th and 19th Centuries. More recently it is renowned for its beauty and culture, becoming England's first UNESCO City of Literature in 2012. Norwich boasts attractions both old and new, with the likes of Norwich Castle and Felbrigg Hall or the popular riverside walk which invites visitors to stroll along the river and take in the local wildlife. The Theatre Royal is a popular venue in the city, originally opening its doors in 1758, getting rebuilds along the way before a recent refurbishment in 2007 that turned the theatre into the modern venue that it is today. For a truly unique theatrical experience however, you would be hard pressed to find something more surprising than the Norwich Puppet theatre, the only one of its kind in the UK, located in a Medieval church. 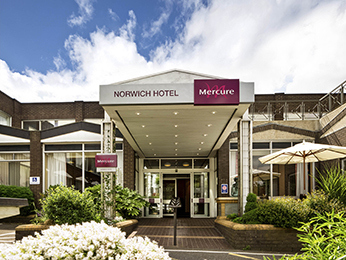 Norwich is accessible by road from the A47, rail and air from Norwich International Airport, which offers regular flights to Schiphol. Booking a hotel in Norwich couldn't be easier. Simply browse our selection of hotels below and choose one that best suits your needs. Booking online with AccorHotels offers a host of benefits, including our Best Price Guarantee and last minute and real-time room availability.